I am pretty happy with the latest release from -Hanaya-. It is a really cute mailbox that will look great in a naturey kind of place. It opens at a touch and reveals stuff inside. But the best part is, that one of the included versions is a fully functioning mailbox with mail drop. So it doesn’t just look cute – it works! The owner menu settings allow you to customize how the mail box works – you can have it email you a notification, you can turn on/off hover text, you can set a thank you message that people get when they leave a mail. And you can even disallow mail drop for those times when you really don’t want any mail XD. 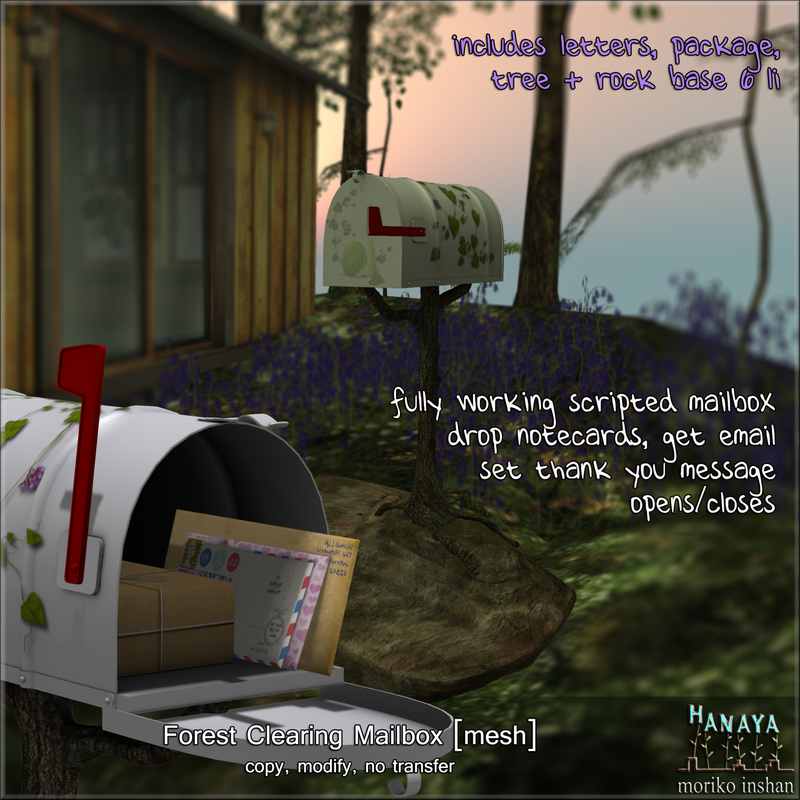 Anyway, the -Hanaya- Forest Clearing Mailbox is now available for purchase at our in-world store, at the RFL Home & Garden Expo, as well as the SL Marketplace. Have an awesome weekend and keep an eye on our blog for other products in the Forest Clearing Collection. This entry was posted in Product Announcements and tagged Forest Clearing, RFL Home & Garden Expo, Second Life, SL on February 27, 2016 by moriko.